“I do not have a favorite restaurant or bar in D.C., nor in any city I’ve ever lived in.” So goes my answer to a question I get asked far too frequently. I have a favorite mood though, and it’s one I’ve been lucky enough to find myself in quite often lately. Relaxed on a late summer afternoon, thirsty for something shaken and cool, in the company of someone who takes seriously the matters of the palate. Preferably far away from restaurant row. When I’m in this mood there’s nowhere I’d rather be than at the bar of Southern Efficiency, my bum firmly planted in a tractor-seat-turned-bar-stool as I await the attention of my barman. The setting sun shines through West-facing windows, beaming through faded blue and turquoise soda syphons and hitting whiskey bottles hard on the label. The natural lightshow brings about a rare type of friendly tranquility. And while the room lulls one into a state of peaceful repose, the food and drink thrill and satisfy. It’s Southern and also efficient, both not in the way I had expected. It’s Southern in concept but not in gimmick. The majority of the menu consists of the good Southern classics cleaned up, dishes deemed genuine and down right necessary on any Southern menu. 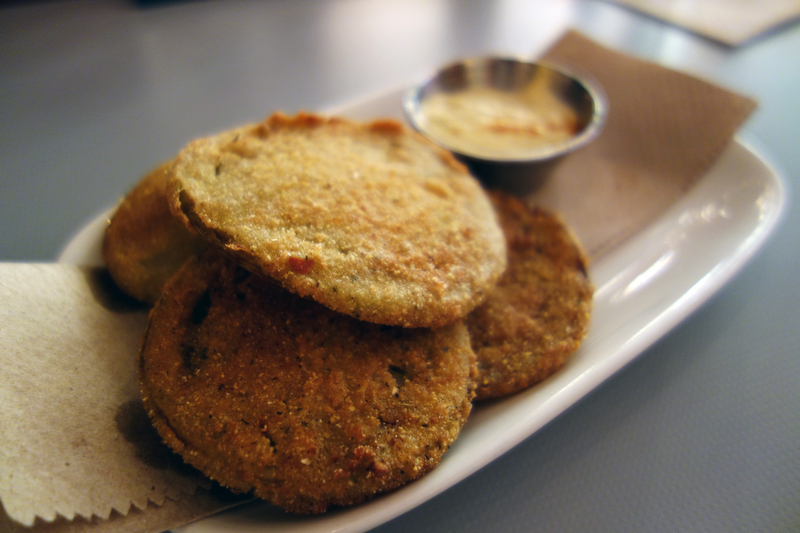 There are neat disks of fried green tomato and a ramekin of house-made pimento, yes. But no greasy chicken ‘n’ waffles acting the part of a down-home favorite. There are also things on the menu that I, with my very limited and Northeastern biased knowledge of the South, have never heard of. The Country Captain is a classic that seems far too ethnic (Indian) to be a staple in the American South. But I learn that it is. It’s a curried chicken and rice dish with almonds and raisins, which apparently got lost at sea through the East India Trading Company and washed ashore in Savannah, Georgia. From there it was quickly adopted into Southern cuisine. Southern Efficiency’s version is made with Carolina Gold from Anson Mills. A very Virginian Peanut Soup also shows face on the menu; it’s a classic I know exists but barely ever see around town. At Southern Efficiency Bourbon is king, baby. Neat rows of cautiously, correctly curated bottles line the back wall. 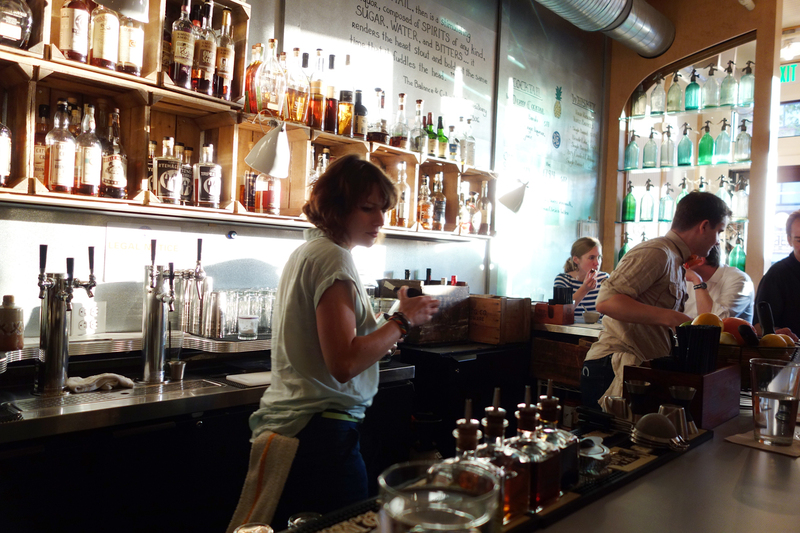 The selection is manageable in size, accessible to the whiskey layman and aficionado alike. It’s limited enough to encourage guests to try something new instead of staring, mouth agape, at an overwhelming library of liquor. Theirs is a bar program you can at least make a dent in over the course of one night. And it fits the place like a custom tailored suit. An efficient approach. Ingredients mixed in with these Bourbons (and some rums) are cool things like smoked cola and strawberry soda. The majority of their house cocktails are pre-made in jam jars kept in a reach-in close-by. Some of them are on tap. This means wait time for your booze is but a matter of seconds. More efficiency. Of course some cocktails are best made fresh to order. Here the girl bartender seems just as passionate and talented as the boy in the bowtie. As she shakes together Very Old Barton, vermouth and triple sec her smile melts away and her expression becomes glazed over with concentration. Her rhythm is trance-like. I get a classic Julep. The icy cool breeze of mint deftly slapped out of leaves which are then sprinkled with powdered sugar. Or I get a jar of rum and white Zinfandel. Or I get a beer, any one of 4 craft brews they have picked out for the tap. They’re all Southern, relatively unknown and wonderful. According to our bardude Chef Shapiro is known for his charcuterie, a statement that doesn’t excite me too much at first because at this point who the hell isn’t, really? But when I peep the generous layer of glossy aspic coating a piece of meat which is demoted in title to “Pressed Ham” but which is actually a beautiful terrine of smoked shanks and asparagus, my heart flutters a tad. 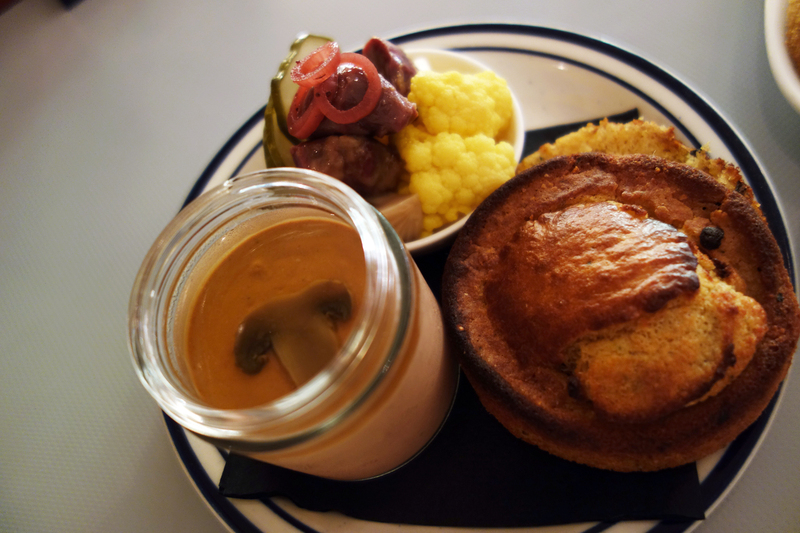 The Chicken Livers & Gizzards is a pretty dish with buttery smooth liver mousse cooked into a 4 oz. glass jar with a cloudy layer of firm and bouncy gelatin sealing the top. 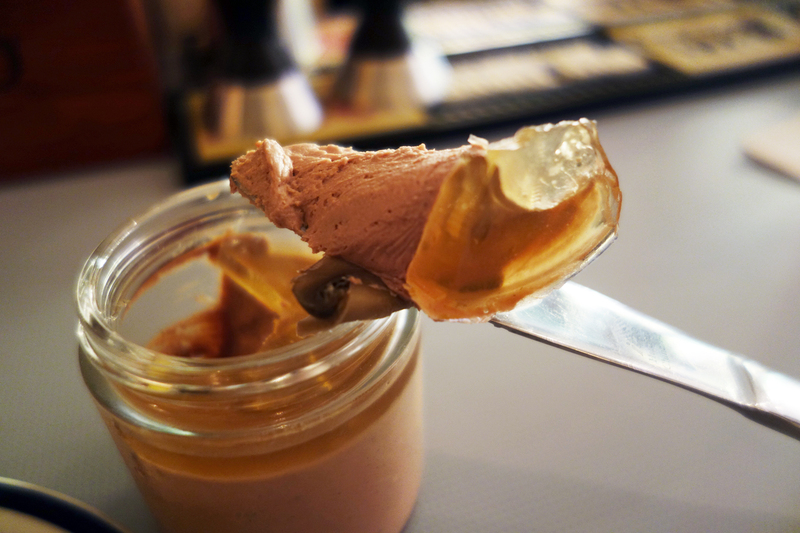 The mousse melts helplessly from the heat of my tongue, leaving behinds a mineral twang and the surprisingly boozy finish from the sherry it is flavored with. A nod at Mockingbird Hill next door? The texture contrasts perfectly to the tight, elastic aspic which has a bit more of a bite to it but which also melts into its liquid stock base after a few seconds in my mouth. The mousse is served with cornbread shaped into a fluffy muffin, grilled for warmth and char. It’s spotted with black pepper. It has a fantastic grainy texture but is also firm enough to smear the cold mousse onto without crumbling to bits from the pressure. In a neat little ramekin are red wine vinegar pickled shallots, cauliflower and radish. 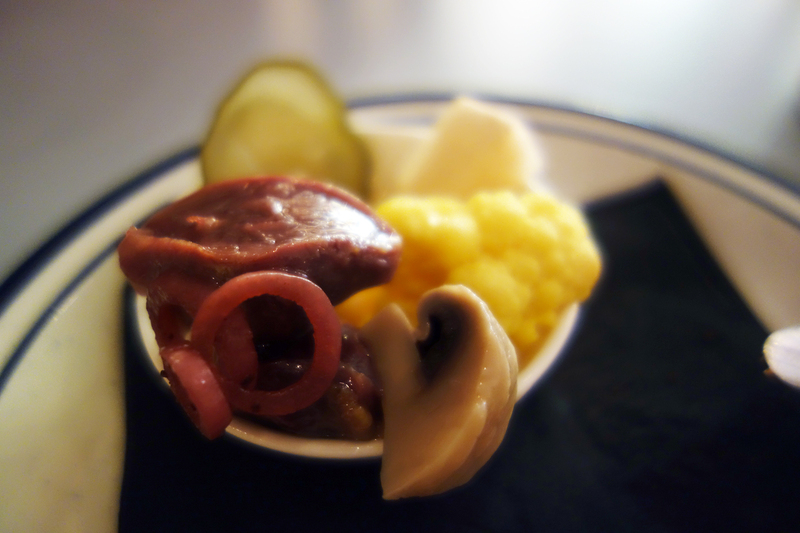 There are also three lightly pickled chicken gizzards, chewy and briny and complex. I recently ate at Southern Efficiency with my mother who was visiting for the weekend and who had never before tried fried green tomatoes (though she’s seen the movie). I felt the pressure. Recently I’ve had some pretty mediocre versions of this dish around town and I really wanted her first experience to be a good one. They came piping hot in neat little disks, lightly coated in cornmeal and fried to a perfect crunch. Spicy mayo on the side. No clever tricks or frills here, just a very well done version of a simple little snack I love, one which she now loves too. Mission accomplished. Fried fish seems to always appear on the menu in some form or another. Recently I had a cornmeal crusted and fried catfish on a bed of creamy cornmeal, some crab and shrimp boudin on the side. The fish itself is wonderfully fresh, its bright white flesh practically glows against the golden brown coat. The cornmeal is great too, with plump beads of corn left whole here and there, and some chewy pieces of shrimp meat adding textural intrigue. Wilted into the cornmeal are bright green leaves of baby spinach. They add a silkiness to the dish that ties it all together. I was a little worried about something fried sinking into a wet purée. Fear of sogginess loomed. 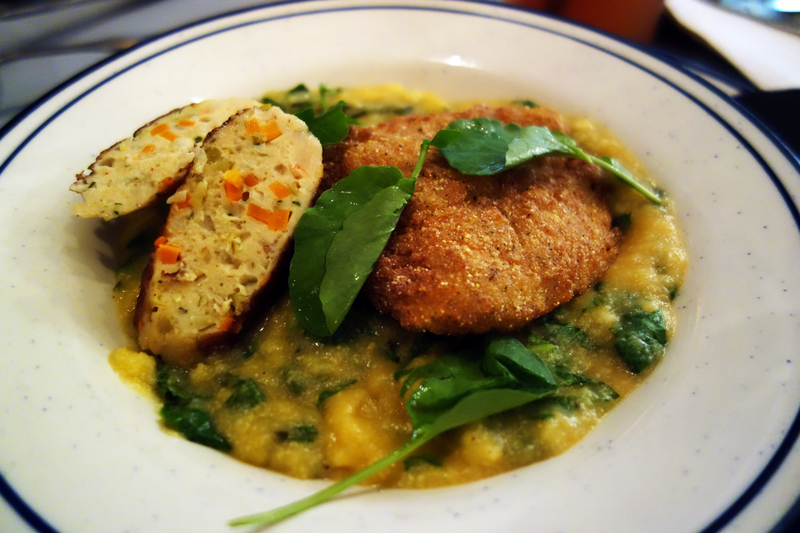 But the crispy, grainy cornmeal crust maintained its texture, contrasting wonderfully with the mushy soft corn. The juxtaposition worked out. The boudin blanc had a rubbery texture and reminded me of the fish cakes floating atop noodle soups in China. It was flavored with tarragon and cardamom and tasted like the first few days of autumn. Some bright orange bits of carrot added natural sweetness. Dessert is, quite appropriately, Bourbon Balls. Crumbled vanilla sugar cookies are held together by plenty of butter and sticky sweet honey. It’s boozy, soaked in Bourbon, with shards of toasted pecan peeking forth from the smooth cookie dough type base. 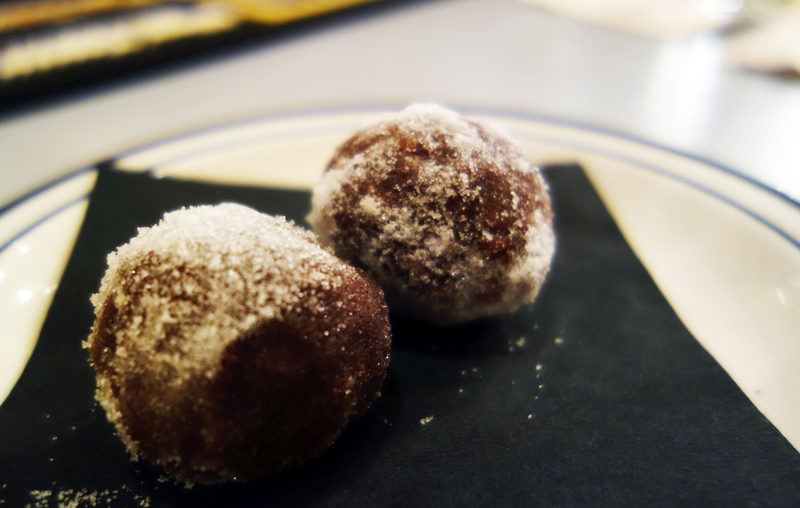 The balls are rolled in a fluffy confectioner’s sugar that reminded me of wet sand sticking to my feet after a day at the beach. They’re soft and easy to eat, another simple thing executed perfectly. At one point the sliding window between counter and kitchen slings open and the sound of a bang-snap firecracker is audible, followed by mischievous back-of-house snickering. It seems the kitchen staff has gone rogue. Or maybe they’re just making sure to keep the bar service on its toes. 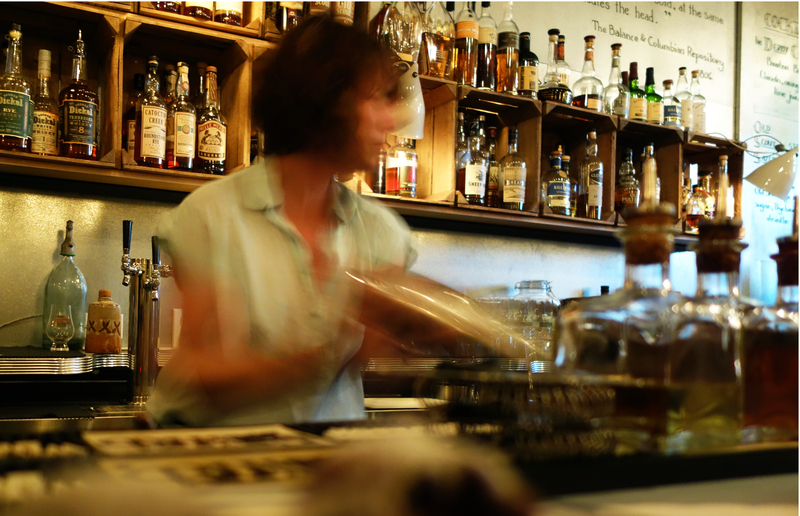 Bartends roll their eyes in feigned irritation but they can’t hold back the warm smiles that surface shortly after. They love their job and the place where they do it. And they make you love it too. July 3, 2014 in WASHINGTON D.C..